Click here for a bigger image! 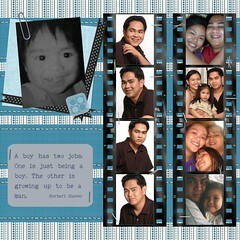 It was my dear husband's birthday last Sunday, and so I got the creative juice flowing and made a digiscrap layout for him. Unfortunately, Photoshop was going bonkers because of low [hard-disk space] memory, that's why I only got to finish the layout this morning. Yes, almost depleted my ATM fund. Ahahahha. Then I asked Trent, an officemate of Dar if he could give Dar a few of the gifts during office hours. Dar kasi has a shift on a Sunday morning. Sobrang pasalamat ako kay Trent! Good thing he was game enough to do it for Dar :) I even asked him to buy the frappe and cake on the day itself because I didn't want to leave the house na and go to Eastwood to do that, baka mahuli pa ako. Di ako nagkamali ng nilapitan. Hehehe. So Saturday, after shopping my legs out for Dar's gifts, Trent and I met so I could give him the gifts and give him some of the instructions for Sunday. Then Sunday early early morning, I woke up to put some of the gifts inside Dar's cabinet [the shirt, jeans, undies, etc]. Then when he woke up and found some of the gifts, I went down to the car to put some of the gifts there, too. Ang ingay nga lang nung car lock, obvious tuloy! Pagpasok ko sa kuwarto, while he was opening the gifts I "hid" sa cabinet, sabi nya, "Aha, ibig sabihin, meron din sa sasakyan!" Then around 2pm, just as Trent bought and left the cake on Dar's area, Dar texted me with this message: "Asan ka?" Hahahha, confused!!! But, lemme tell you, this will be the last time I'm going to do this! Gawd, ngayon lang ako napagod mag-shopping! wow!... it was a very well thought surprise (baka pwedeng mahiram...hehe). natawa ako when Dar text you "asan ka?"... but it was very sweet gesture. hi nette! :) sobra, nung nagshopping ako nung saturday, alam ko na dapat kung saan ako titingin nung mga damit na bibilhin ko para di ako magtagal sa mall ;) hehe.